I've been a big fan of the Aliens series ever since I saw the first film back in the 1980's. I've read all the books, including the expanded universe (non-canonical) ones from Bantam, and more recently from Titan books. I've watched and read the Aliens vs Predator crossover media, some which is great, some not so great. I've watched all the films of course (the first two many times), including the dreadful Prometheus which promised much but delivered nothing. As a fan, Prometheus has made me wary of watching Alien: Covenant. Thankfully the story, at least this version penned by the talented Alan Dean Foster, is much better than it's predecessor. 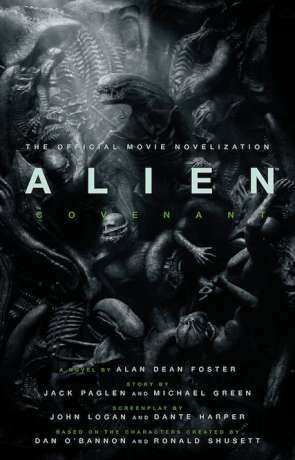 For those who don't know, it was Foster who wrote the novelisations for the original Aliens stories in the 1970's and 1980's. Foster knows his Aliens. The story begins over a decade after the events of Prometheus and concerns the colony ship Covenant. The ship is already on-route to the distant planet Origae-6 where it is hoped the settlers can terraform the planet and create a viable human outpost. Things don't go smoothly though and the ship sustains some damage, forcing crew members out of statis for repairs. While said crew members are up and about they receive what appears to be a human distress call from a nearby, unknown, uncharted planet. As they need the time to repair anyhow they decide to investigate. As you can imagine things go pear-shaped from there. The resulting story itself is good, and Foster does a great job of telling it. It does go some way to making up for the previous travesty but at the same time it doesn't do anything to move the Alien Universe forward in any meaningful way. Yes it acts as a prequel to the original film and explains how we get from black slime to face-hugging but the majority of the story is lifted straight from the original two films complete with dramatic chest-bursting and naughty Android. After forty years I would have hoped to have come further than a re-telling of the same story. I get that some film studios seem to think you have to re-tell a story to a new audience but personally I don't agree, if you want to experience the original story you should do just that. Having said all that, Foster writes a convincing, dark tale with good use of tension and dramatic flair. I enjoyed the book and was hooked most the way through. Its a return to proper Aliens with the acid blood and nashing teeth not to mention the sneaky smarts and relentless pursuit of their prey. It works well in part due to the authors dedication to the subject and he does as well as anyone could have while still sticking to the plot laid out by screenwriters Dante Harper and John Logan. As far as pacing is concerned it also feels like a merger of the first two Alien films, not matching the slow horror and tension of the first but not as frantic and gung-ho of the second. I personally don't consider this a horror novel in any sense, although some seem to describe it as such. So in summary, Alien:Covenant is a nail-biting read and a solid return to the wonderful universe imagined all those years ago by Scott, Giger, O'Bannon and of course Foster. I just hope that now we are on firmer ground we can take this series in some new directions with future follow-ups. Written on 12th June 2017 by Ant.